Using Noise to Probe Seafloor Tsuwei Tan – ttan1@nps.edu Oleg A. Godin – oagodin@nps.edu Physics Dept., Naval Postgraduate School 1 University Cir. Monterey CA, 93943, USA Popular version of paper 5aUW7 Presented Friday morning, November 9, 2018, 10:15-10:30 AM 176th ASA Meeting, Victoria, BC Canada Introduction Scientists have long used sound to probe the ocean and its bottom. Breaking waves, roaring earthquakes, speeding supertankers, snapping shrimp, and vocalizing whales make the ocean a very noisy place. Rather than “shouting” above this ambient noise with powerful dedicated sound sources, we are now learning how to measure ocean currents and seafloor properties using the noise itself. In this paper, we combine long recordings of ambient noise with a signal processing skill called time warping to quantify seafloor properties. Time warping changes the signal rate so we can extract individual modes, which carry information about the ocean’s properties. Experiment & Data We pulled our data from Michael Brown and colleagues . 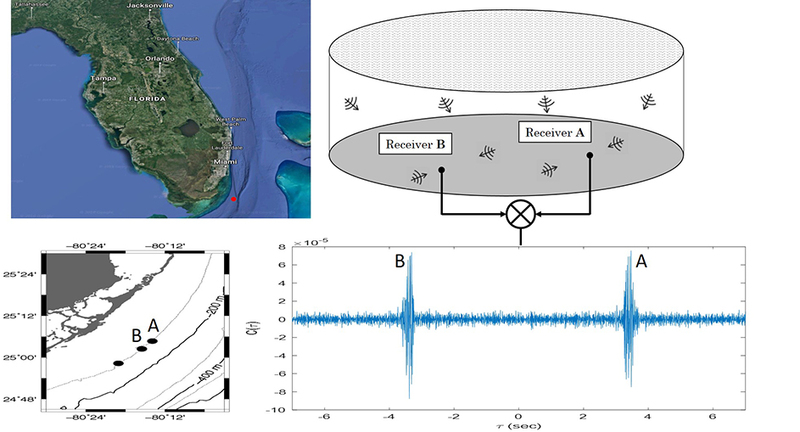 They recorded ambient noise in the Straits of Florida with several underwater microphones (hydrophones) continuously over six days (see Figure 1). We applied time warping to this data. By measuring (cross-correlating) noise recordings made at points A and B several kilometers apart, one obtains a signal that approximates the signal received at A when a sound source is placed at B. With this approach, a hydrophone becomes a virtual sound source. The sound of the virtual source (the noise cross-correlation function) can be played in Figure 2. There are two nearly symmetric peaks in the cross-correlation function shown in Figure 1 because A also serves as a virtual source of sound at B. Having two virtual sources allowed Oleg Godin and colleagues to measure current velocity in the Straits of Florida . Figure 1. Illustration of the site of the experiment and the cross-correlation function of ambient noise received by hydrophones A and B in 100 m-deep water at horizontal separation of about 5 km in the Straits of Florida. Figure 2. Five-second audio of correlated ambient noise from Figure 1: At receiver A, a stronger impulsive sound starts at 3.25 sec, which is the time it takes underwater acoustic waves to travel from B to A. Listen here Retrieving Environmental Information Sound travels faster or slower underwater depending on how soft or hard the seafloor is. We employ time warping to analyze the signal produced by the virtual sound source. Time warping is akin to using a whimsical clock that makes the original signal run at a decreasing pace rather than steadily (Figure 3a 3b). The changing pace is designed to split the complicated signal into simple, predictable components called normal modes (Figure 3c 3d). Travel times from B to A of normal modes at different acoustic frequencies prove to be very sensitive to sound speed and density in the ocean’s bottom layers. Depth-dependence of these geo-acoustic parameters at the experimental site as well as precise distance from B to A can be determined by trying various sets of the parameters and finding the one that best fits the acoustic normal modes revealed by the ambient noise measurements. The method is illustrated in Figure 4. 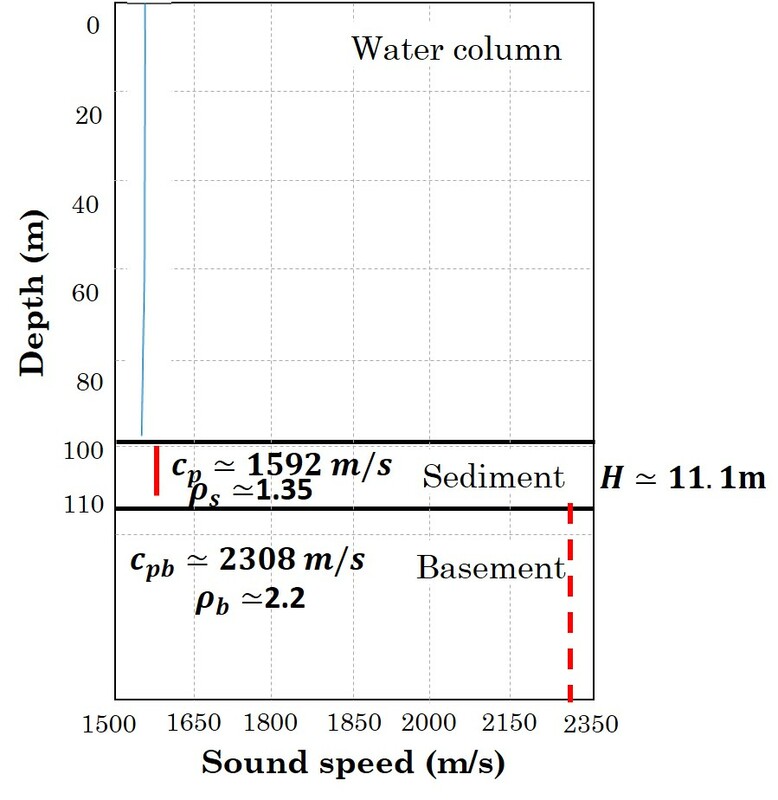 The sound of the virtual source (Figure 2), which emerges from ambient noise, reveals that the ocean bottom at the experimental site is an 11 m-thick layer of sand overlying a much thicker layer of limestone (Figure 5). Figure 3. 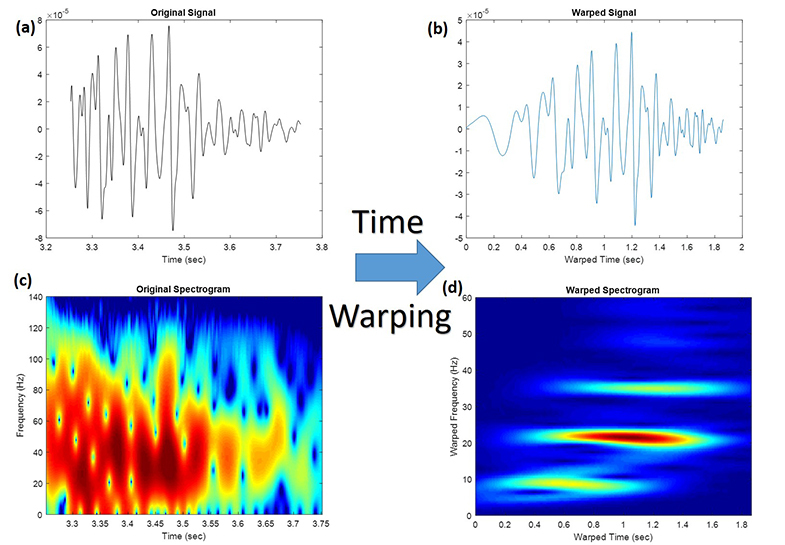 Time warping process: Components of the virtual source signal from noise are separated in the spectrogram of the warped signal from (c) to (d). Figure 4. Comparison of measured travel times of normal modes to the travel time theoretically predicted for various trial models of the ocean bottom and the geometry of the experiment. The measured and theoretically predicted travel times are shown by circles and lines, respectively. Individual normal modes are distinguished by color. By fixing the geo-acoustic parameters (sound speed and density), the precise range r between hydrophones A and B can be found by minimizing the difference between the measured and predicted travel times. The best fit is found at r = 4988m. Watch here Figure 5. Ocean bottom properties retrieved from ambient noise. Blue and red lines show sound speed in water and bottom, respectively, at different depths below the ocean surface. The ratios ρs and ρb of the bottom density to seawater density are also shown in two bottom layers. Conclusion Ambient noise does not have to be an obstacle to acoustic remote sensing of the ocean. We are learning how to use it to quantify ocean properties. In this research, we used ambient noise to probe the ocean bottom. Time warping has been applied to ambient noise records to successfully measure sound speeds and densities at different depths below the seafloor in the Straits of Florida. Our passive acoustic approach is inexpensive, non-invasive, and environmentally friendly. We are currently working on applying the same approach to the extensive underwater ambient noise recordings obtained at several sites off New Jersey during the Shallow Water 2006 experiment. Reference  M. G. Brown, O. A. Godin, N. J. Williams, N. A. Zabotin, L. Zabotina, and G. J. Banker, “Acoustic Green’s function extraction from ambient noise in a coastal ocean environment,” Geophys. Res. Lett. 41, 5555–5562 (2014). O. A. Godin, M. Brown, N. A. Zabotin, L. Y. Zabotina, and N. J. Williams, “Passive acoustic measurement of flow velocity in the Straits of Florida.” Geoscience Lett. 1, 16 (2014).